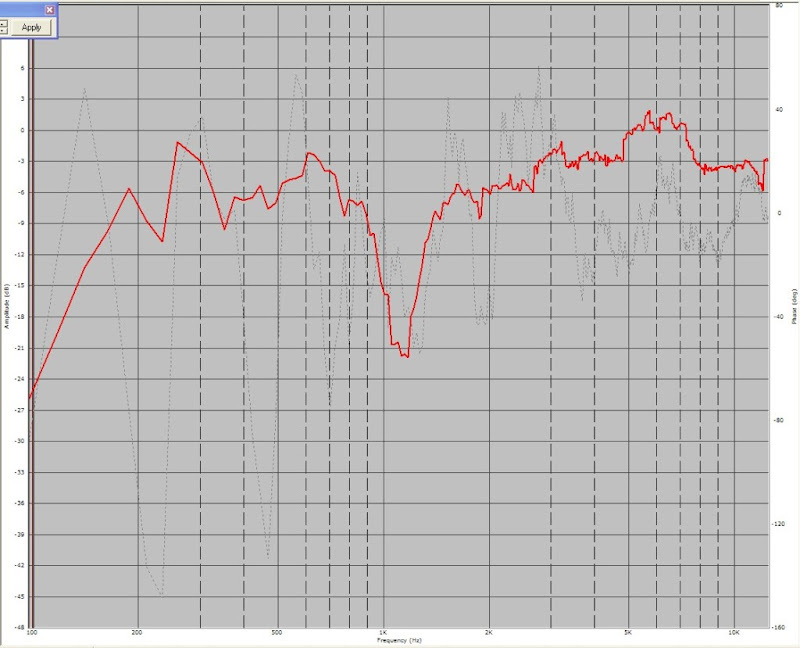 This is the frequency response of my horn, with just two drivers. The midrange is a Dayton ND91. 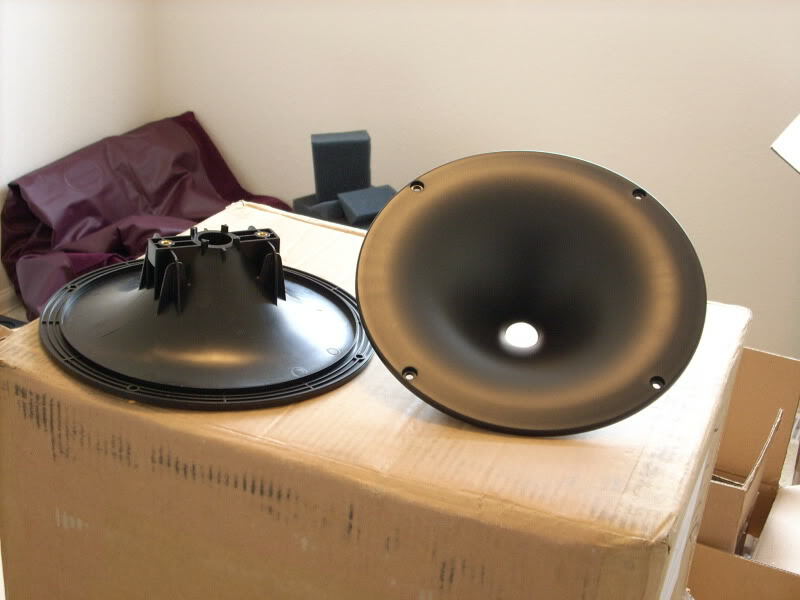 The tweeter is a Celestion CDX1-1425. The crossover consists of exactly one component: a 22ohm resistor. 2) Upper frequencies are clean and extended out past 20khz, much better than I could do with a DE250 or a D220Ti. Maybe I'm getting carried away, but this is the first Synergy horn I've built where all the pieces just fell into place. Right now I think that all that's needed is another midrange to raise the output below 900hz, some frequency contouring on the tweeter, and I'm d-o-n-e.
Have been listening to this thing for a few hours now, in mono, duct tape and all. It sounds magnificent. I posted a video to Youtube without any EQ on the horn; but I've been listening to it with EQ to flatten out the response. 2) At the time I thought that the only way to 'fill in' the hole was to raise the level on the midranges, raise the level on the tweeter, or both. I think that Paul Spencer ran into similar issues with his Synergy horns; note that he used six midranges on one of his projects. 3) Adding midranges or tweeters works; just ask Tom Danley, some of his products use over a hundred drivers. This Unity horn was for my car, and I simply didn't have space for any more midranges. Four was all I could fit, and even that was an ugly mess. ^^^ Again, these are seven year old measurements. This new project is proceeding a lot smoother than my old ones did. ^^^ Another weird thing about that project was that I didn't understand that the length of the port adds a delay to the midranges. I think that's why both the in-phase and the out-of-phase response is so screwy. When the midrange and the tweeters were wired in phase, the ports were so long, it was adding about 180 degrees of rotation at the crossover. 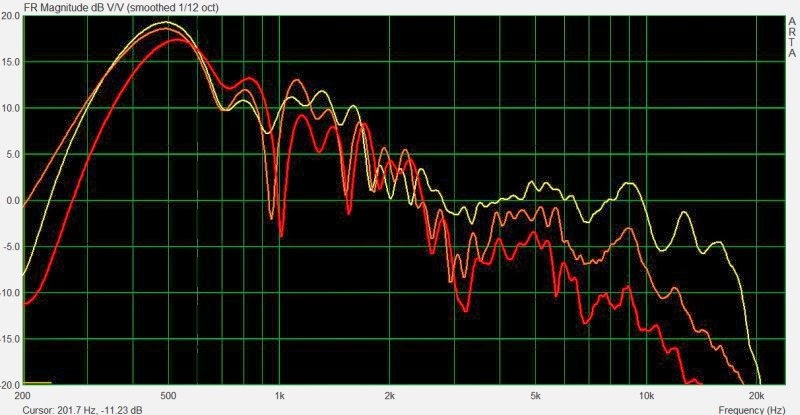 The net effect was a dip in the frequency response, even though the drivers were wired in phase. Reversing the phase filled in the hole, but added a peak lower in frequency. Last edited by Patrick Bateman; 8th November 2013 at 05:29 AM. Last edited by xrk971; 8th November 2013 at 11:59 AM. 1) The crossover from midrange to tweeter is so seamless it's ridiculous. I've been trying to achieve this kind of a transition for half a decade. The big 'Eureka' moment was when I realized that narrowing the wall angle 'fills in' the hole that had plagued all of my other Unity horn project. 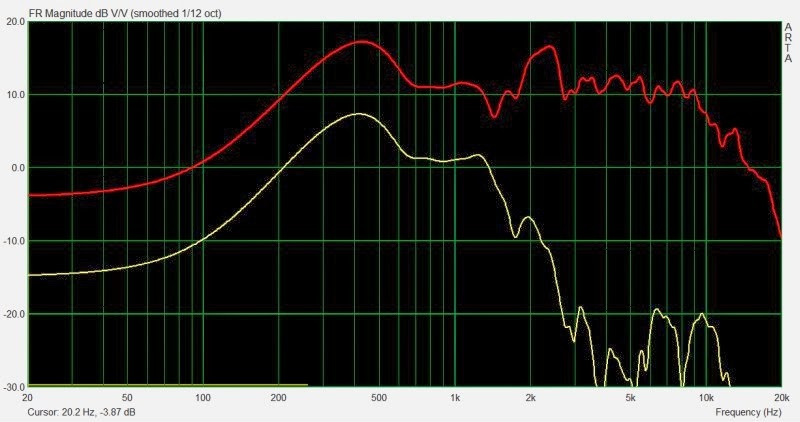 The midrange "hole" that could not be fixed by reversing polarity was due to the phase difference between drivers at the acoustical crossover, not the horn wall angle. It could have been fixed with delay, or proper passive crossover implementation (very difficult to do without looking at phase). The detail one can hear from from very narrow HF dispersion horns can be very engaging on axis, things in the mix normally lost in room reverberation can be heard clearly. Your new horn appears to have a smooth on axis response. It would be interesting to see it equalized flat on axis (no smoothing), then see the curves at 5 degree increments out to 40 degrees off axis. P.S. -Just listened to the video, the HF response just dissapears when you can't see the throat. Last edited by weltersys; 8th November 2013 at 07:32 PM. Since I accidentally turned this into the 'drugs and waveguides' thread, I'll try to get things back on topic. At the throat of a waveguide, we want a really smooth transition from compression driver to waveguide. This is easy to do with a commercial waveguide, but when you build your own, it is very tricky. 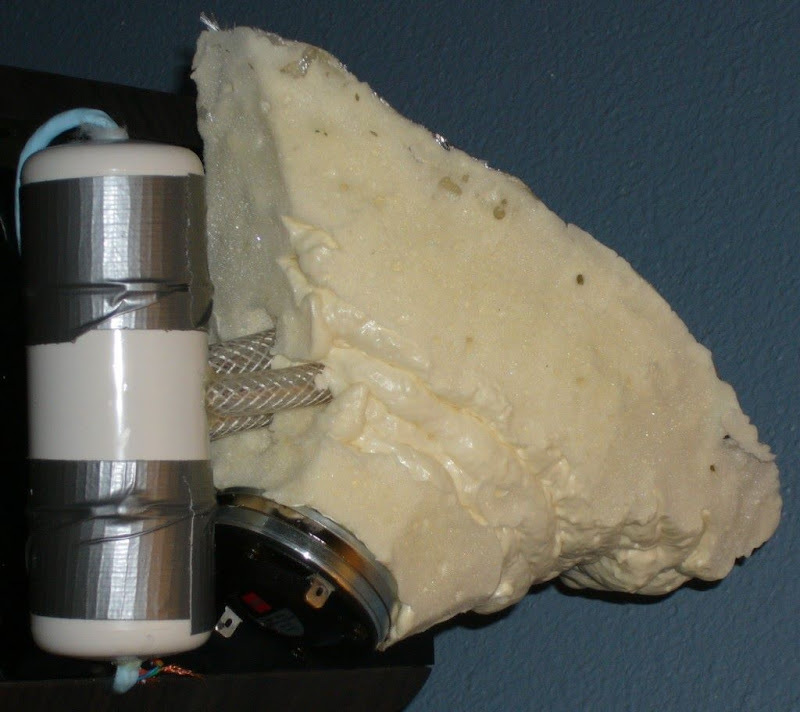 Back when I first started building waveguides in fiberglass, I would make the throat the same size as the compression driver. This doesn't work so great, because you always have to file down the throat, to make sure it's a perfect match. So when you file down a 1" throat, you end up with a throat that's a little too big. The solution that I've used for the past couple years is to simply make the throat a little too small, and then I run a drill bit right down the middle. This gets you a perfectly symmetrical 1" opening. Unfortunately, this solution isn't perfect, because you need a material for the horn that is both strong and substantial. Wood would work great, but wood isn't ideal for the complex shape of a waveguide, particularly at the throat. Fiberglass is so so. 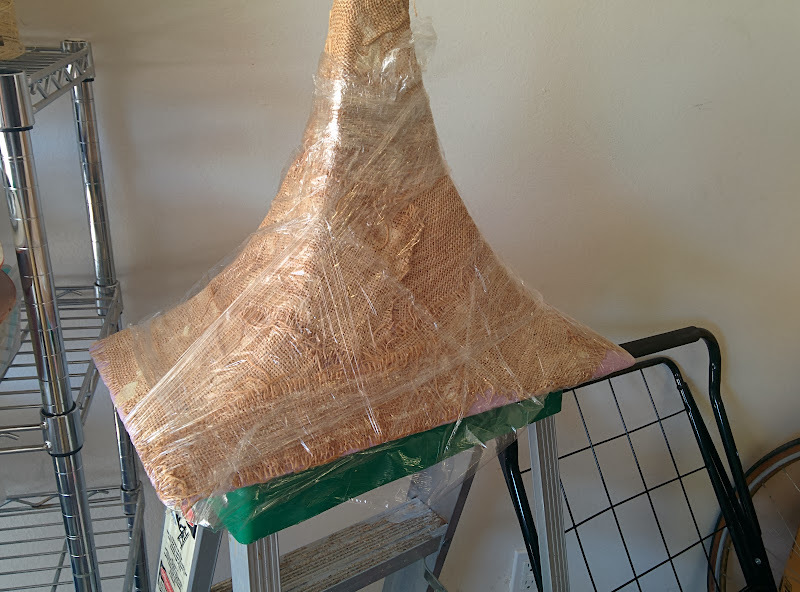 My main gripe with fiberglass is that it takes a decent amount to build up enough thickness. Fiberglass mat works, but it isn't as strong as fabric. Carbon fiber works great, but carbon fiber is expensive. Ideally, I would want something like carbon fiber, but cheaper. Easier to work with would be a nice bonus. 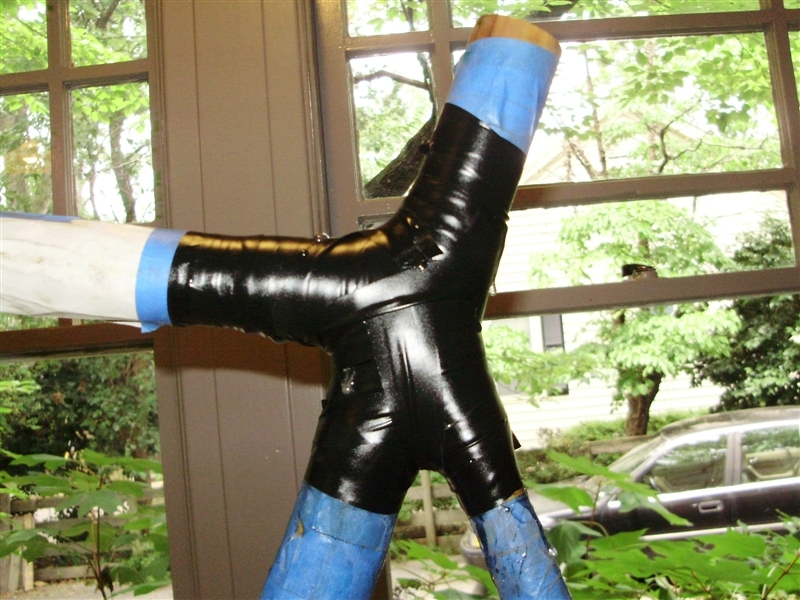 A throat made of carbon fiber produces a smoother finish than a throat made of fiberglass. Here's an alternative to CF, that seems to work much better than I'd dreamed. First, you go to a craft store and buy a ball of hemp yarn. The reason that we want hemp is because hemp is strong, and it has a lot of surface area, due to the rough microscopic nature of the strands. Second, get yourself some gorilla glue. Now take the hemp and run it under the faucet. We're getting it wet because moisture makes gorilla glue cure faster. Now the messy part. Put some gloves on, put the hemp yarn into your hand, and pour some gorilla glue onto the yarn. Now really squeeze it! We want the glue to be thoroughly saturated into the yarn. 2) I was astonished at how quickly the gorilla glue cures when you add water to the hemp. What would normally take 24 hours took about one. 3) When the water/hemp/gorilla glue cures, it's hard like concrete I simply couldn't believe how strong it was. It's insane. As demonstrated by Calfee, it can take a serious beating. 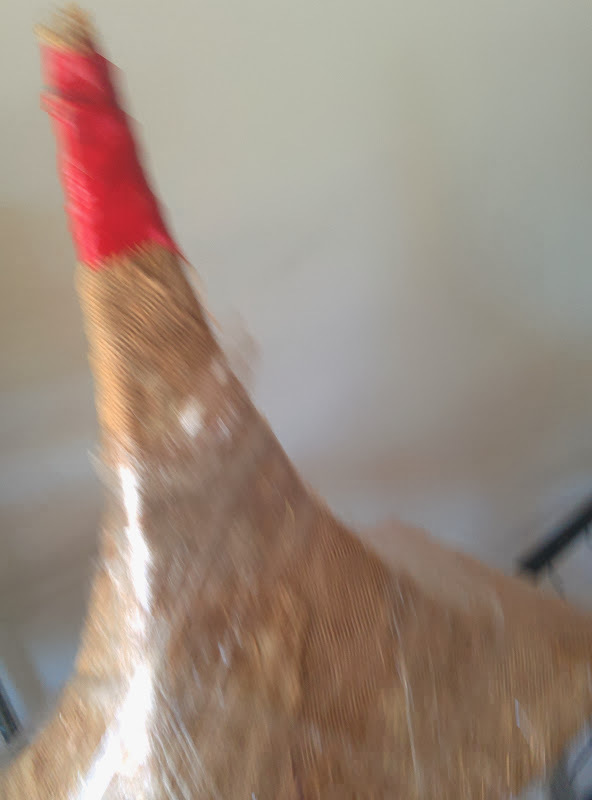 Basically the ideal material for the horn throat is strong, easily sanded, and produces a smooth finish. Carbon fiber fits the bill. Fiberglass less so. Bond is fairly terrible, because bondo has virtually no strength. I can't count the number of waveguides where the bondo simply delaminated from the waveguide. 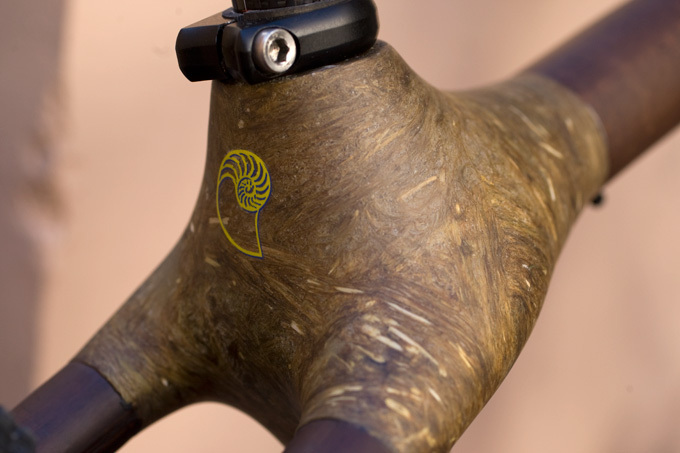 Hemp works pretty darn well, and is an interesting and inexpensive alternative to carbon fiber. In the previous measurements I only had one midrange on the horn; now I have four. Now I have a ridiculous problem - my midrange array is more efficient than my compression driver! What a strange problem to have. I may have to 'cut' the mids to bring their efficiency down to the tweeters level. 2) Even with the dipole peak reduced via a filter or via a larger baffle, the mids are still at least 6dB more sensitive than the tweeter. This is kinda amusing, because the efficiency of four of them on a baffle is something like 90dB. My tweeter has an efficiency of 107dB iirc. So we're getting a ton of gain from the horn. The crossover is currently three components. A 1.5uf cap on the tweeter, and an L-Pad that's a 10ohm resistor in parallel with the compression driver and a series 2ohm resistor. Without the L-Pad I found I was getting a peak at 2500hz as the impedance of the compression driver rose. Here's a measurement showing the combined response, and the midranges alone. That seems to have reduced the dipole peak and also made the in-room sound more natural. In the final speaker I'll probably use fiberglass batting to accomplish the same thing. 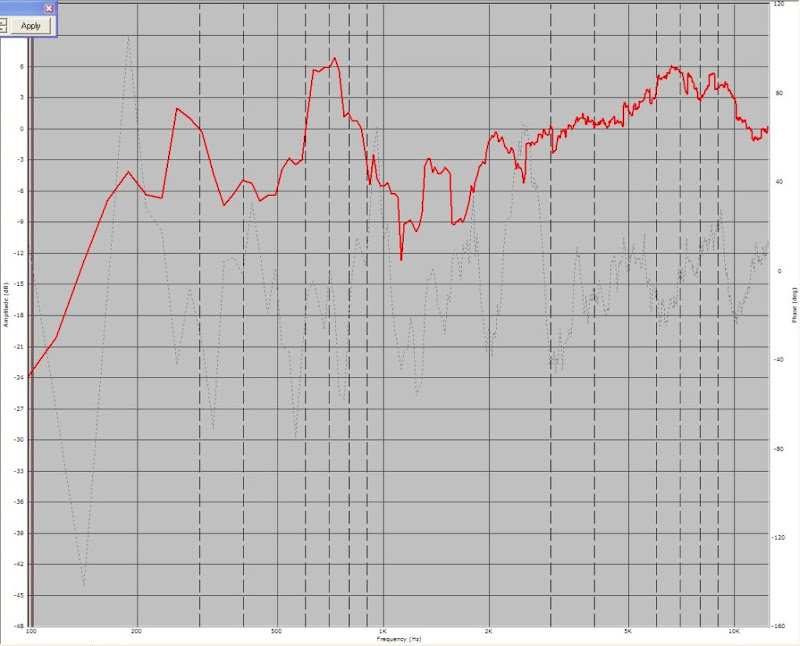 Also, this measurement illustrates the peak at 2500hz which I mentioned in my last post. I was able to eliminate that peak by replacing the series resistor with an L-Pad. Doing that 'normalizes' the impedance curve. Obviously the response will change quite a bit once I add a baffle, and I plan to make it cardioid-ish also.